Do Conscious Thoughts Cause Behavior? In the late 19th Century, Thomas Huxley advanced a view he called “automatism”. This view says that conscious thoughts themselves don’t actually do anything. They are, in Huxley’s famous analogy, like the blowings of a steam whistle on an old locomotive. The steam comes from the same boiler that drives the locomotive’s pistons, and blowings of the whistle are well correlated with the locomotive’s starting to move, but the whistling contributes nothing to the motion. Just so with conscious thoughts: the brain processes that produce our behavior also produce conscious thoughts, but the thoughts themselves don’t produce anything. Automatism (later known as epiphenomenalism) is currently out of favor among philosophers, many of whom dismiss it without bothering to argue against it. But it has enough legs to be the target of an article by Roy F. Baumeister and colleagues in this year’s Annual Review of Psychology. These authors review a large number of studies that they regard as presenting evidence “supporting a causal role for consciousness” (p. 333). A little more specifically, they are concerned with the causal role of “conscious thought”, which “includes reflection, reasoning, and temporally extended sense of self” (p. 333). The majority of the evidence they present is claimed to be evidence against the “steam whistle” hypothesis that “treats conscious thoughts as wholly effects and not causes” (p. 334). To understand their argument, we need to know a little more about the contrast between unconscious thought and conscious thought. To this end, suppose that a process occurs in your brain that represents some fact, and enables you to behave in ways that are appropriate to that fact. Suppose that you cannot report – either to others or to yourself in your inner speech – what fact that process represented. That process would be a thought that was unconscious. But if a process occurs in you, and you can say – inwardly or overtly – what fact it is representing, then you have had a conscious thought. What if I tell you something, or instruct you to do some action or to think about a particular topic? Does that involve conscious thought? Baumeister et al. assume, with plausible reason, that if you were able to understand a whole sentence, then you were conscious, and at least part of your understanding the sentence involved conscious thought. (For example, you could report what you were told, or repeat the gist of the instruction.) They also clearly recognize that understanding what others say to you may, in addition, trigger unconscious processes – processes that you would not be able to report on. If you want to do a psychological experiment, you have to set up at least two sets of circumstances, so that you can compare the effect of one set with the effect of another. If your interest is in effects of conscious thoughts, you need to have one group of participants who have a certain conscious thought, and another group who are less likely to have had that conscious thought. The way that differences of this kind are created is to vary the instructions given to different groups of participants. For example, in one of the reviewed studies, participants randomly assigned to one group were given information about costs and features of a cable service, and also instructed to imagine being a cable subscriber. Participants in another group received the same information about costs and features, but no further instruction. A later follow up revealed that a significantly higher proportion of those in the group that received the special instruction had actually become cable subscribers. In another study, the difference was that one group was asked to form specific “implementation intentions”. These are definite plans to do a certain action on a certain kind of occasion – for example to exercise on a particular day and time, as contrasted with a more general intention to take up exercise, but without thinking of a particular plan for when to do it. The other group received the same information about benefits of the action, but no encouragement to form specific implementation intentions. Significantly more of those who were encouraged to form implementation intentions actually engaged in the activity. The logic behind these studies is that one group was more likely to have a certain kind of conscious thought than the other (due to the experimenters’ instructions), and it was that group that exhibited behavior that was different from the group that was less likely to have had that conscious thought. The correlation between the difference in conscious thoughts and the difference in subsequent behavior is then taken as evidence for a causal connection between the (earlier) thoughts and the (later) behavior. There is, however, a problem with this logic. It arises from the fact (which, as noted earlier, the authors of the review article acknowledge) that conscious processing of instructions triggers unconscious processes. We can easily see that this is so, because processing what is said to us requires that we parse the grammar of sentences that we understand. But we cannot report on how we do this; our parsing is an unconscious process. What we know about it comes from decades of careful work by linguists, not from introspection. Since conscious reception of instructions triggers unconscious processes, it is always possible that behavioral effects of the different instructions are brought about by unconscious processes that are set in motion by hearing those instructions. The hearing (or reading) of instructions is clearly conscious, but what happens after that may or may not be conscious. So, the causal dependence of behavior on instructions does not demonstrate causal dependence of behavior on conscious processes that occur after receiving the instructions, as opposed to unconscious processes that are triggered by (conscious) hearing or reading of instructions. (1)	If Jones had not had the conscious thought CT, Jones would not have been as likely to engage in behavior B. (2)	Jones’s conscious thought CT caused it to be more likely that Jones engaged in behavior B.
What’s the difference? The first allows something that the second rules out. Namely, the first, but not the second, allows that some unconscious process, UP caused both whatever conscious thoughts occur after receiving instructions, and the subsequent behavior. The experimenter’s giving of the instructions may set off a cascade of unconscious processes, and it may be these that are responsible for both some further conscious (reportable) thoughts and for subsequent actions related to the instructions. If the instructions had not been given, those particular unconscious thoughts would likely not have occurred, and thus the action might not have been produced. Analogously, if the flash of an exploding firecracker had not occurred (for example, because the fuse was not lit) it would have been very unlikely that there would have been a bang. But that does not show that, in a case where the fuse was lit, the flash causes the bang. Instead, both are caused by the exploding powder. The procedure of manipulating instructions and then finding correlated differences in behavior thus establishes (1), but not (2). So, this procedure cannot rule out the steam whistle hypothesis regarding conscious thought. Interestingly, there are some cases for which the authors of the review identify good reasons to think that the steam whistle view is actually the way things work. For example, one study compared people who imagined a virtuous choice with those who had not done so. In a subsequent hypothetical choice, people in the first group were more self-indulgent than those in the comparison group. This difference was removed if the same activity was imagined as a court-ordered punishment rather than a choice to volunteer. However, it seems very unlikely that anyone consciously reasoned “I imagined myself making a virtuous choice, therefore I’m entitled to a bit of self-indulgence”. In this, and several similar reported cases, it seems far more likely that the connection between imagining a virtuous choice, feeling good about oneself, and feeling entitled to self-indulgence runs along on processes that do not cause conscious thoughts with relevant content. The article under discussion is full of interesting effects, and these are presented in a way that is highly accessible. But it does not succeed in overturning an alternative to its authors’ preferred view. According to this alternative view, the causing of behavior (after consciously perceiving one’s situation, or consciously receiving instructions) is done by unconscious processes. This alternative view allows that sometimes, but not always, these unconscious processes also cause some conscious thoughts that we express either in overt verbal behavior, or in sentences about what we are doing that we affirm to ourselves in our inner speech. This entry was posted on Monday, December 12th, 2011 at 12:28 pm and is filed under causation, consciousness. You can follow any responses to this entry through the RSS 2.0 feed. You can leave a response, or trackback from your own site. 7 Responses to Do Conscious Thoughts Cause Behavior? Well, even science is proving that consciousness is not in the brain… The brain is a processor and control center for the physical form… The only way souls and spiritual forms can have a physical experience and truly affect this reality, we had to take on a body or vehicle that is bound by the laws and physics of this reality… This is why we say that we are ‘having a human experience’ we are actually way more than physical matter. I agree that consciousness is not physical. However, I don’t think that’s a result that science by itself can prove. Many neuroscientists would agree that science alone is not capable of proving whether or not consciousness is physical. A majority of those who would not agree with that think that science has proved, or will soon prove, that episodes of consciousness are identical with events in the brain. Whether consciousness can affect physical reality (i.e. whether episodes of consciousness can cause anything to happen in the brain or any other part of the physical world) is a vexed issue. My own, rather unpopular, view is that they cannot do so. The majority position among philosophers is that episodes of consciousness are identical with brain events, and so can cause physical effects (i.e., other brain events). It’s evident from that that most philosophers do not think that science has proved that consciousness is not in the brain. 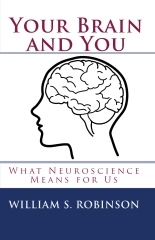 I don’t try to resolve these issues in _Your Brain and You_, but I do explain why they are so hotly contested, and I explain how we can think of ourselves consistently with believing that consciousness does not have physical effects. actions like typing in the computer driving have a concious part? It is these actions are purely unconscious or every action has a concious and unconcious action? In normal circumstances, you are conscious of what you’re trying to say as you type, and where you want to go when you’re driving. You normally get where you’re trying to do when you drive. With writing, it’s a bit trickier. You write something that is more or less satisfying when you re-read it, but, at least if you’re like me, you often think of an improvement, and go through several versions before you feel satisfied. The actual driving and the actual typing of the words is heavily dependent on unconscious processes (unless you’re a beginner in those activities). More interesting is the thoughts of which you become conscious. They are provided to you by unconscious processes in your brain. In a phrase from Your Brain and You (which has a chapter on “control” of our thoughts, our actions, and our attention) your thoughts are like gifts from your brain. In very summary terms, we have limited control, but we are a lot more dependent than we usually suppose on processes which take place entirely outside of our consciousness. You’re right that “conscious” and “unconscious” are terms that raise unresolved issues. Even so, it does not seem possible to say we have control over what we are unconscious of. Everything we do and everything we think is a product of activity in our brains. This may sound like we are being controlled by an alien. But one of the main points of Your Brain and You is to explain how the “alien” is really ourselves, and to explain how this fact should affect our attitudes toward ourselves and other people. Conscious thought is what? thinking–” I am conscious” ? So before an action a thought must spring up that says, “I will do x action” or the action then could not be caused by a “conscious” thought? All I can do is cite Hume and say that one thought before an action is not enough to establish causation of the same action by the same thought. There must be many instances and each must be preceeded by the same thought. And you must establish that the action does not happen unpreceeded by the thought. Just how often does it happen that before each of many instances of an action the same “conscious thought” occurs? Seems to me not so often. If there are no recurring “conscious thoughts” before an action–how can you then establish causation? But what is thought? One could argue that all mentality is in some way thought and since any action comes from the brain and the brain is the seat of mentality, action is also a mental thing and so, no action happens unpreceeded by thought and thought therefore is proven to cause action. And when the thought is “conscious” the action is caused by “conscious thought”. And, of course, the whole issue is clearly founded upon the mind /body, mental/physical split. But where does mental end and physical begin? And how many instances establish causation? And what is the cause in any case? Thought is part of the universe–we are all part of its operation–so is it the universe which is the cause? All action happens in a context—how much of the context is necessarily to be included in the cause? And what is the same thought? and what is the same action? —-and where is the necessity that a “conscious thought” indicates necessarily some kind of agent entity?–could be just another notion–after all, the notion of a unicorn doesn’t indicate you can grab one by the horn. Very unwieldy topic. Lots of issues and assumptions involved. None of which, it seems to me, has any necessary answer. Define terms as you wish– No one is stopping you—and you can decide the matter straight away. About Hume’s requirement of constant conjunction, I think it’s only fair to defend Baumeister, et al. a little here. The studies they cite have many participants. That enables us to have many cases where it’s very likely that participants had a conscious thought (i.e., one that they were in a position to report), and many cases in the other group where participants likely did not have a conscious thought with the same content. And there was a subsequent behavioral difference between the two groups. — I am not retracting my doubts about the logic of such experiments, but on the narrow question of whether they were respecting Hume’s demand for “constant conjunction”, it seems that they were. Where they failed was that they did not rule out a common cause explanation. The brain is the seat of mentality, but not everything the brain does is regarded as “mental” by most people. For example, brain neurons control breathing and heart rate, but few regard these as “mental” involvement of the brain. Likewise, neural events in the brain cause consciousness, but it does not follow that everything the brain does causes consciousness. It doesn’t even follow that everything the brain does that has a “mental” aspect has a *conscious* aspect. Again, I certainly agree that there are many questions my post did not address that concern mind/body, agency, and so on.